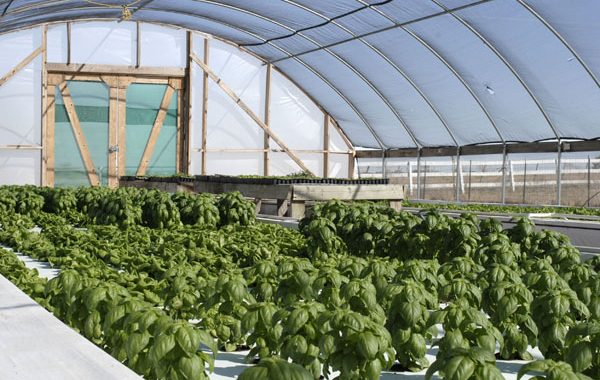 With winter of 2012 in full swing, we’re feeding in 3 buildings and raising produce in 2 buildings. Even though the feeding rate has slowed down, the output is tremendous. What I’m showing you now is some Kale that is out-of-the-ordinary in size. Proof positive that deep water raft culture can do something that gravel beds cannot do. Even though this is just a couple of pieces, we’ve managed to install hundreds and hundreds of pounds. I let this go an extra ten days in the system, so roughly a month in the system. Started to show slight amounts of iron and magnesium deficiencies, but nothing objectionable. One more time a new product has come out. I have two types of Kale, five types of lettuce and several types of herbs. Have elected not to do a fruit this winter. Just too busy (which is a very good problem to have during the winter). My germination rate is strong as ever and feeding rate is strong as ever. Here in Texas we’ve had extremes of very mild and deep cold weather. Weather is not affecting me. I have a single layer of film on top – not a double blanket. I’m burning 60,000 btu of propane every night. That rate is 8 hours keeping ambient temperatures in the mid-50’s Fahrenheit. And, the water temperature has yet to fall below 62. It’s dangerous for water temperature to dip below 68, so we cut back on feeding schedule. The enormous amount of conversion is still there. I’m well past solstice and headed into the new year. One more time, thank you so much from Lilypad Farm. PS: By the way, the Kale has been selling out at the market and tastes great! Please i like to will when will you be giving practical workshop in 2016.